Of course, like any other profession massage therapists need tools — 21st-century tools. With massage and alternative therapies booming across the world, massage therapy is increasingly becoming a mainstream profession and requires therapists to rely on digital tech to keep pace with their clients and manage their business professionally. What can be a better tool than a smartphone app? So here are my favorite 5 massage apps. Great for a massage therapist, Yoga instructors, and physiotherapist because it tells you the best trigger point for a particular pain pattern. If you work with the Trigger point framework then you will know the memorizing the pain patterns of all the skeletal muscle is an impossible task. Complicating things even further is that one muscle can have multiple trigger points and each trigger point can have multiple pain patterns. Great app to identify and fix pain easily and best of all –– its free for now. 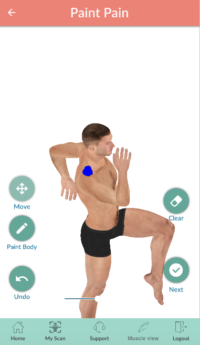 Posture Screen mobile (PSM) is a great app I discovered when trying to find something that can analyze a client’s posture on the fly. In principle, PSM asks you to take a picture of your client from the front and the right side and then asks you to mark various anatomical landmarks. The PSM algorithm then finds how much the neck, ribs, pelvis are tilted or shifted and provides you a report that you can then send to your client customised with your logo and contact details. 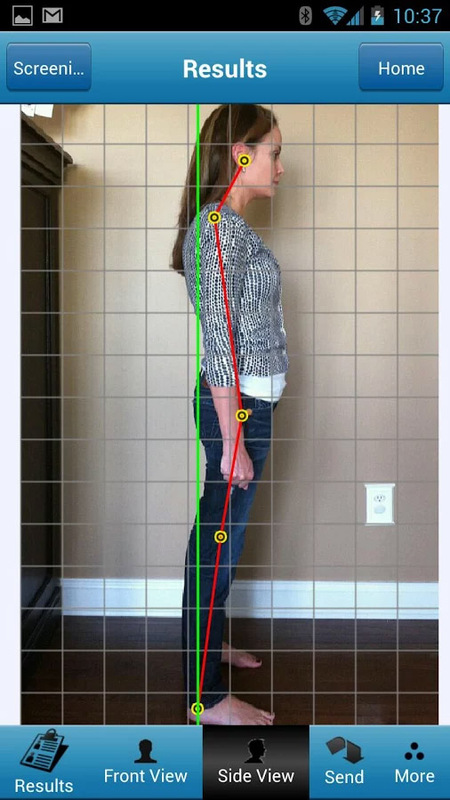 It’s great for clients to understand how their posture is the root cause of their problems and also helps in tracking the progress you are making. The problem is that theoretically, it is a great concept but because it requires accurate marking of anatomical landmarks it depends on your ability to be able to do that well through clothing, body fat and a moving client. Also, you need some fluorescent markers/stickers to mark those anatomical landmarks because you might not be able to find the markers on the picture you have taken. Having to depend on stickers requires clients to wear body-hugging clothing and not move at all or strip down naked but then who wants their naked pics taken on a smartphone and emailed as pdf report! The lateral shift pics are taken from only the right side and assume bilateral symmetry which is never the case and because of that Posture Screen Mobile is unable to assess rotational changes. The pain mapping is difficult with inner thighs and arms areas and is rendered in 2D so it’s not very user-friendly. The other thing is that Android development always lags behind iPhone. Cost $19.99 and required upgrades for pain mapping and other modules. Also, requires in app credit purchases after the first 25 screenings are used up and credits are device specific and not account specific. Great as a basic assessment tool and can help you show your clients the interconnectedness of the various parts of their body and its relationship to their pain/ discomfort. Not strictly a mobile app but has a pretty good mobile version. 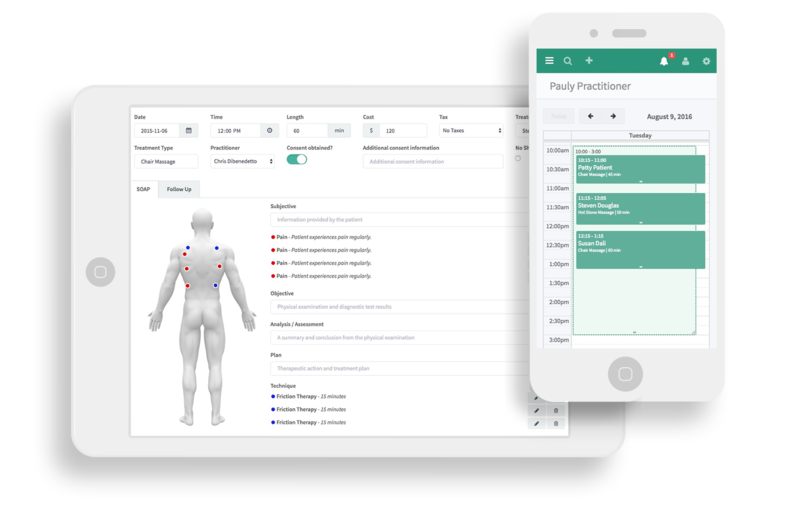 Embodia offers practitioner a way to prescribe and track exercises and education articles to their clients. 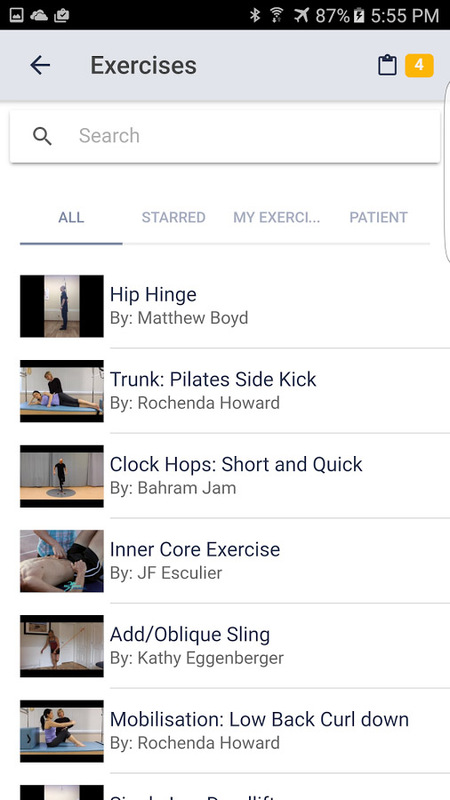 The app has a significant number of videos on some of the common areas that require home exercises like the back, hips etc.The best part is that with Embodia, the practitioner can select these the exercises and send it to the client who will download the Embodia client app. The app would remind and track them on when and how to do the exercises (video based instructions). Nice uncluttered interface and can be useful to various kinds of therapists. $15/month! Yes, that’s right. For that price, the videos database is not that exhaustive ( a cursory search on youtube could give similar videos) then Embodia is basically a calendar/task/reminder app which makes the $15 a month quite steep for a therapist to pay. Very helpful for a massage therapist who has or wants to have a deep professional relationship with their client or is working with high-performance individuals. Helps to keep a connection with the client and build a long lasting and hopefully profitable relationship. Of course, you should have strong cash flows to be able to afford it. Has several versions some with a fixed model and others that show movement. What I love about it is its smooth 3 D interface and the ability to rotate and move the model around. Great details on the various muscles, organs, vascular and nervous systems and works as a great tool for patient education. The motion version is also great for explaining movement to clients. Also great for massage students who want to learn anatomy in an interesting way. The cost at $24.99. At this price it a bit expensive when there are other free online anatomy apps like Zygote body (though its interface is not as good). 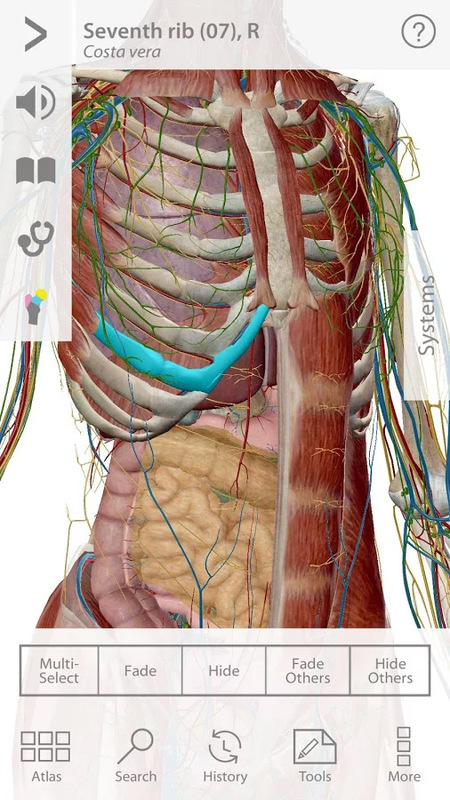 Great for massage students to learn anatomy in an interactive way and old hands to refresh and refer to on the fly. Considered the biggest app in the Massage industry. Offers a complete solution to a massage therapist to manage their business, clients, sessions, billing and even basic marketing. Offers the ability to take highly technical SOAP notes including marking body area (not 3D though) and being able to access these files. SOAP Vault helps you keep very accurate and exhaustive client information and guides you through the process in a systematic manner. The big one is the pricing. Starts at $19/mo. That can be a lot for some people especially those who are just starting their business. The thing that SOAPvault misses is the very weak home exercise section and the inability to conduct any analysis of the pain the client is suffering. A great product if you have a well-established massage business. Will take care of a lot of your hassles if you can afford it.